We'd love for you to join us at the 99 City Road Conference Centre in the heart London's Silicon Roundabout for DConf 2019! If you are a student, academic, or a major open source contributor, we want to see you in London! Please contact social@dlang.org to apply for a 50% discount on the general registration rate. Even if you've never worked with the D Programming Language, we'd love to meet you. The general registration rate is $400. This year, we are required to tack on a 20% VAT, so the total amount is $480. Advance registrations are open until May 6, 24:00 AOE. Registrations will be open at the venue throughout the first day of the conference (May 8). 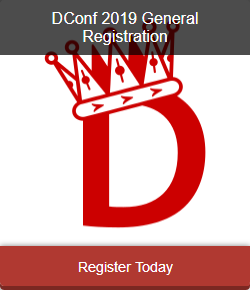 Keep an eye on our Twitter feed, the D Announce forum, or the official D Blog for registration news. We support registrations through FlipCause and PayPal. If you are registering with a credit card rather than an existing PayPal balance, choosing FlipCause will be more efficient for us, so we encourage you to do so. Thanks!